Input all your monthly outgoing, the spreadsheet will then calculate the total outgoings. 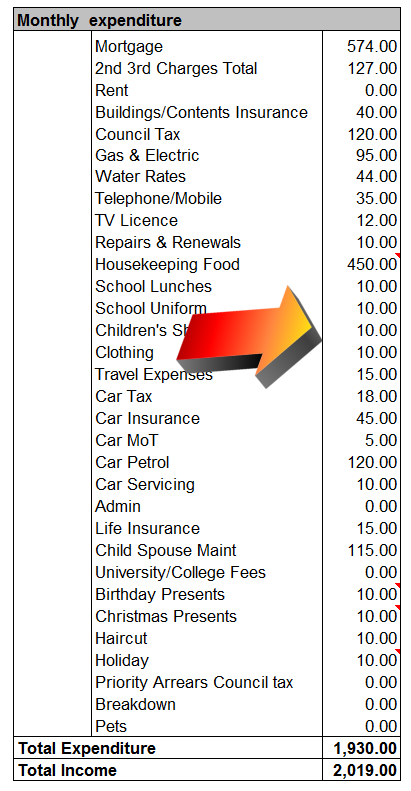 Also when you complete the expenditure you will be given addition information (cells marked with a red flash in the top corner) as to what figures are best to use in certain cells. The Spreadsheet will then calculate what disposable income is available for the creditors. Finally enter the unsecured creditors to whom you owe money to. As you enter each creditor it will show you how much each creditor would receive on a pro-rata split. We have also included a sample Income & Expenditure highlighted by the red tab in the spreadsheet.